The Levellers wanted to restrict the time one person could serve as MP to a year to prevent the growth of a political class. They were acutely conscious that MPs should not be a class apart, as Nicholas Winterton would have them be, but those with careers and farms and practices who sprang from the constituency and whose interests were those of their neighbours and fellow worshippers who returned them to Parliament. The dissolution of this Rotten Parliament will also see the retirement of the last remnants of MPs who served as their forebears have served since the seventeenth century. But if this was the Rotten Parliament, the next threatens to be the Parliament of Dags. Instead of revitalising the moribund and dis-empowered local parties, party HQs have exercised even more of a stranglehold over candidate selection with Dag Quotas and parachuted Dags, giving voters an unprecedented field of Dag candidates of such uninspiring mediocrity that their only distinguishing characteristic is the degree of sycophancy towards party bosses that each evinces. They will form a parliament of fawning, creeping, obedient nonentities competing wetly for junior office, holding to the evil lie that 'politics is a profession'. The next election will improve the health of our democracy about as much as an infection of Smallpox. 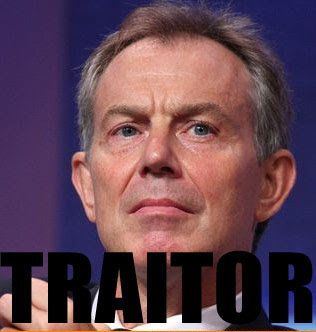 The choice is between Brown, a liar, a crooked deceiver, a coward, who suborns every trace of honourable conduct and responsibility to his own interest, and Cameron, a sincere and honourable man but weak as a reed and who lacks the intellectual strength to put country before party. God help us. My only real hope is that the election sparks the fires of chaos in Parliament, and that from the ashes something good may be reborn. 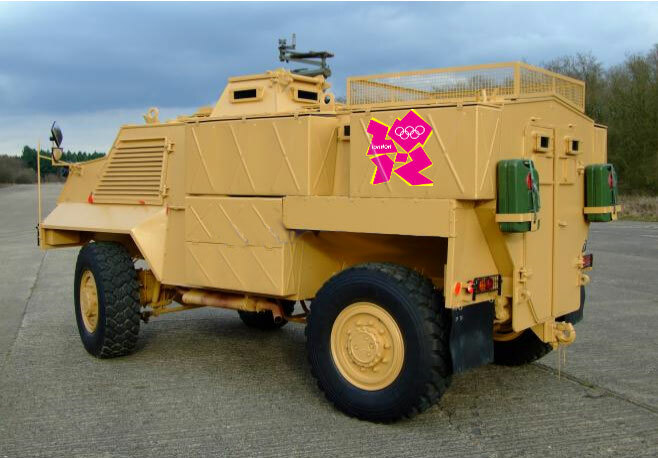 Not only will the fat-cats of the Olympics family have entire arterial roads and the Blackwall Tunnel closed for their cavalcades, much as politburo bosses in a column of Zils did in Soviet Moscow, but security fears over their trip through the rougher parts of South London have prompted LOCOG to buy 70 surplus UK Saxon armoured vehicles at a bargain price of about £15k each. The Saxons, from Territorial Army stocks, have been refurbished by Witham Specialist Vehicles with suede bucket seats, surround sound systems and cocktail cabinets in the armoured bodies. Seats have been widened from the standard 14" to 23" to accommodate the larger Olympic arses, with each Saxon holding up to four fat-cats. With a top speed of 60mph, Olympic officials are expected to be safe from irate local populations, who will be banned from leaving their own roads and held by cattle-pen barriers as the VIPs whizz past. No comment to make, I just think the officer's name should be given due credit. Even Dickens wouldn't have dared invent it, just proving that truth really is sometimes stranger than fiction. Big Society or Big Smokescreen? Well, this is no Big Bang Localism. But then who thought it would be? This key Conservative policy could have been so much better, but as it stands, it really is vacuous, pointless and without much substance. Firstly, the policy correctly identifies the neighbourhood as the fundamental building block of local administration. We all know the boundaries of our neighbourhood, and if left alone, the inhabitants of Lewisham could produce an accurate plan of the sixty or so neighbourhoods in the borough within weeks. And, er, that's about as far as it goes. No new democratic structures, and above all, no devolution of the borough budget and no power. Cameron's policy has the brave aspiration "that every adult in the country becomes an active member of an active neighbourhood group", but ignores the fact that people will ONLY get involved if real money and real power is there. So what has he shied away from? What should he have had the balls for? Neighbourhoods will be able to bid to take over the running of community amenities, such as parks and libraries that are under threat. Why just those 'under threat'? And many of these facilities will be 'under threat' because the council has reduced or removed their budgets; will the Neighbourhood get the budget from the council? Will the Neighbourhood directly employ TUPE-transferred staff with accumulated redundancy and pension entitlements? Will the Neighbourhood inherit crumbling buildings and infrastructure? Or will the Council Tax for the Neighbourhood be reduced if they take on such an asset? Neighbourhoods will be given a right of first refusal to buy local state-owned community assets that are for sale or facing closure. This will cover assets owned by central government and quangos, not just town halls. To do what with them? If this is a right to acquire land for commercial development, it's a good start - but it won't be. Currently the public sector sells land assets to fund capital development projects, with the receipt from the sale at market value. Does the right imply that neighbourhood groups would be able to acquire land assets at below OMV? Is there an obligation to keep them in their old use, or can they be profitably redeveloped? Neighbourhoods will also have a right of first refusal to take over and run vital commercially-owned community assets when they shut down – for example, those post offices, pubs and shops whose continued survival is of genuine importance to the local community. Again, this is nonsense. Businesses close because they are unprofitable. Distorting the market by eliminating a factor cost - labour - is unsustainable. Volunteers may give their time for free to serve in the shop for a short while, but then rotas will get harder to fill, the facility will increase closures until you have a village pub open only from 6pm to 10pm on Wednesdays or whatever. This isn't the answer. Try giving neighbourhoods power to determine business rates and whether smoking is allowed in the pub or not and you might have a chance. We will give neighbourhoods detailed street-by-street crime data, so that they can hold the police to account at local beat meetings. Big deal. Without operational control and elected police bosses at borough level, all these meetings will become are acrimonious justification-fests. Neighbourhoods will be able to start their own school, giving them greater control over their children’s education. But why not take over the local primary school? Again, would budgets be devolved, or local Council Tax reduced by the costs of local running of a school? Neighbourhoods will be given the power to engage in genuine local planning through collaborative democracy – designing a local plan from the “bottom up”. But no local veto on development - no local development control, no licensing powers, no power at all except the spurious 'power' to attend a meeting. We won't be able to block the horrid HAs from converting our closed pubs to warrens for Nigerian overstayers or block a license for a pole dancing club in the old butchers. We will use the Sustainable Communities Act to ensure that neighbourhoods have access to line-by-line information about what is being spent by each central government agency in their area, and the power to influence how that money is spent. Again, weasel words. Not the power to determine local spending, just the power to have a view, which we already have. Allow neighbourhoods to create Local Housing Trusts to enable villages and towns to develop the homes that local people want, with strong community backing. Yes, this could be good - but why not do the obvious thing and allow local HATs to take over council housing within the neighbourhood? Greater access to funding for neighbourhood groups, for example the neighbourhood element of local tariffs raised from development. Yes, but with the true devolution of planning powers, neighbourhoods could get the whole s.106 contribution from development - why not? And not just some token change. This really isn't enough to get everyone involved. The local council is untouched, and retains all its money and powers, and Whitehall retains all its direct powers over local councils. Cameron's Neighbourhood groups will be dominated by narrow interest groups - a local Evangelical church, for example - because they're not required to have any democratic legitimacy. And without any real power or any real financial resources, they will die an early death. This is timid, pusillanimous stuff with little substance. Today is apparently a big launch day for CCHQ of the Conservatives' Localism policy. No doubt many Tory PPCs will be googling away this morning trying to find out what it is. I'll comment later when I see what's revealed. I've finally worked out that this must be Eastern European immigrant week. The first stories about Peterborough's swans being trapped and eaten by EEIs should have set the alarm bells ringing, then the stories about the danger to freshwater fish stocks from EEIs, then the slew of tales of middle Englanders who had woken to find Romanians living in their sheds. These things go straight to the heart of the English; swans, carp and garden sheds are amongst the very things we hold dear. But it wasn't until the East Anglian Daily Times revealed the latest heinous crime challenging the constables of Brandon that the penny dropped. A man (who could have been East European) was seen on CCTV defaecating on a towel laid on the footway. Police are unsure what happened to the towel afterwards. Now it could be that Mark Oaten is supporting the local LibDems, or it could be a critical tourist comment on Brandon's charms, but for my money the story has EEI written all over it. Here in London it's Africans who are the most visible sign of Labour's open door policy - and it seems most of them are having babies. Out in the sticks, it's EEIs. And the problem isn't confined to the South of England; across the country voters are encountering immigrants in circumstances that directly affect their own lives and their own identities. And this is the foremost hidden issue in the coming election, the most damning legacy of Labour's culpable maladministration. Yet not one of the seven posters designed by Saatchi for CCHQ mention immigration; not one carries the image of that that grinning thug alongside the message "I let 2 million immigrants into the UK - Vote for me!" And why? Well, EEIs. You see, Cameron's support of the EU precludes the Conservatives attacking Labour on immigration grounds; all those EEIs are here because of our membership of the EU. Another thought has just occurred to me. Perhaps the Brandon defaecator was just a native, commenting on the state of British politics, after all. Sorry, but I'm just not indignant about anything today. Usually the first coffee and a scan of the news sites produces something to raise my indignation, but not this morning. The three Chancellors? The public verdict seems to have been that all were crap, but Darling was marginally the least crap. Phooee. ACPO to be subject to the FOI Act, but not for a year? That will give the shadowy bastards time to shred the evidence, then. The IPSA's Commons expenses rules? Too late. No, my thoughts this morning are on the water voles of Crossness. You know what it's like when the builders are in; the upheaval of moving to an hotel, nervousness about whether they will sculpt the new ditch bank in the right way, whether the new reeds will be as good as they looked in the showroom. Add to that the worry that, as a walking meal for a host of predators that needs to have a dozen babies at a time, you've suddenly got 50 infants in the hotel with you and the chances of a peaceful sleep are out of the window. I used to spend hours watching the antics of these delightfully busy little chaps down at Hawks Mill. 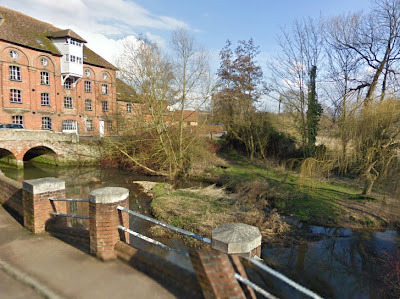 'Streetview' lets me see that the mill and the millpond are still there - but are the water voles, I wonder? Richard Benyon, Tory MP for Newbury, clearly either hasn't been told about his party's Localist policy, or fancies a job as Minister for Maggots and Bloodworms in a new Department for Angling. In what I'm sure he saw as a useful move to 'engage the Angling community' he arranged a publicity stunt including a pledge to set up an 'angling think tank' and no doubt took pleasure in the Angling Times headline 'Tories pledge to shape the future of fishing'. Richard, m'dear. Listen to me. Angling needs neither a minister nor a new quango. 'Shaping the future' of angling isn't amongst the key duties of government. No doubt civil servants, preparing for the next government and eager to impress, sensitive to press announcements such as this, are already drafting the key clauses of a new Angling Bill, setting up a new National Angling Authority that would regulate bait freshness and shinyness standards for lures, advised by a new Angling Advisory Board with at least a dozen highly-paid part time posts for good Tory placemen. Not what you meant? If it wasn't what you meant, what you should have said was "A Conservative government will leave the regulation of Angling to the various local authorities with jurisdiction over our rivers and inland waters. Our aim is to get big government off Anglers' backs and stop making fatuous and unnecessary interventions in what are local matters and a popular hobby." See? Not hard, is it? Janet Daley, writing in the Telegraph this morning, thinks that Cameron has the right vision but lacks the nerve to trust the public with it. However, it just might be that Cameron has the right vision but lacks the nerve to trust CCHQ with it. You see, every time Cameron pledges to devolve power, to return decision making back to the level it belongs, up pops a member of the shadow cabinet to pledge that a Conservative government will legislate to impose minimum insulation values for curtains, or set a national standard for supermarket trollies. Dave may talk the talk about Localism, but he doesn't seem to have told the rest of Team Cameron about it. The Central State is a powerful magnet to the loathsome political class and its dags. Thirteen years in the wilderness and CCHQ, itself a ruthlessly centralist body, dreams of nothing but having a go at working the levers of the Leviathan State. If you've ever tried taking a toy away from a three year-old, you'll know the petulance, tears and tantrums that shadow ministers will throw at the prospect of abolishing their own Departments of State. All the instincts of the political class are to accumulate and consolidate power, not give it away. And the fact that Cameron isn't making firm, unequivocal promises about Localism, and that when you look at the actual words he uses they turn out to be vague aspirations with no substance, means that voters don't trust him. Polls suggest that voters think he'll just replace Labour ministers with Conservative ones and govern for the benefit of his chums, just as Labour have done. And that rather than the Health Act (Abolition) Bill coming before the Commons in the Autumn, we'll see the Domestic Fabrics (Insulation Standards) Bill. And it's hard to defend him from these suspicions whilst Eric and the rest of the lads carry on as though the election were nothing more than a change of watch on the Ship of State.